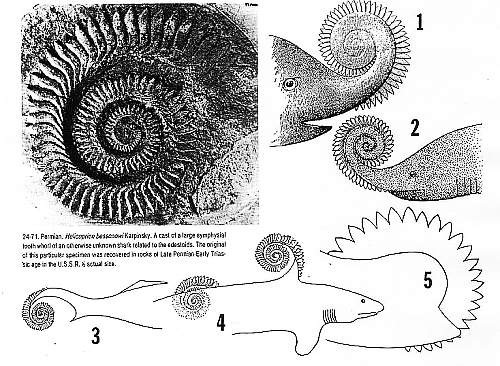 Life Before the Dinosaurs: Helicoprion (Part 1). 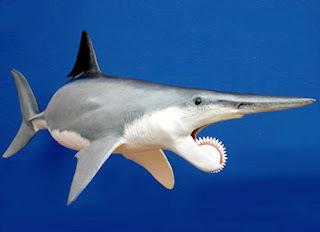 There are a lot of different ideas about how Helicoprion might have looked. The "buzz saw" could have been in the jaw, and that's at least what I think. It also could have been anywhere on the entire body. 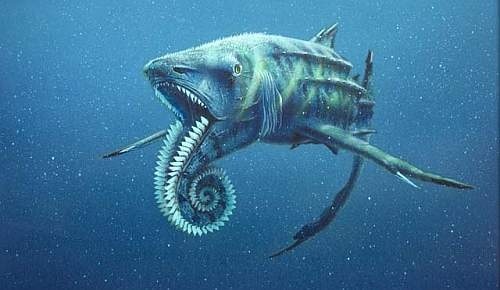 Helicoprion lived Carboniferous to early Triassic. The name is pronounced hella-cuh-PRY-on. The Helicoprion in the picture below may have helped it smash ammonite shells, or any other prey with a shell, including trilobites and other shelled animals. It may look like Sarcoprion, but Sarcoprion only has half a "buzz saw," and this idea of Helicoprion has a whole "buzz saw," but half of it is wedged into the inside of its jaw. The Helicoprion in this last picture may have opened its mouth and let its "buzz saw" hang down while swimming through a school of fish. That way, it could kill many fish and easily just swim around in the school and eat freshly killed fish. If that last one unrolled its lower lip, could it eat its own head? That is REALLY funny!!!! Yes, but it probably didn't help it!! "A possible position is the throat cavity; this cavity could accommodate the dentition’s spiral form, and the dentition would not be subjected to the wear and breakage from biting prey that would occur in a jaw position. In the throat cavity, this dentition was probably supported by the cartilage between the basal margins of the right and left gill arches in sharks. New teeth for the spiral dentition probably originated on this basal cartilage. The teeth may be modified pharyngeal denticles, which occur on the gill arches and basal cartilage in sharks and other fishes. As a throat dentition, when the shark opens its jaws, the teeth would be presented to grab prey entering the mouth cavity. Closing the jaws, the teeth would move the prey toward the esophagus. This type of dentition would work well for catching soft-bodied prey." "The most likely orientation - based on the teeth of Edestus and related edestoid sharks - is that the teeth overhang from the lower jaw like the vertical blade of a circular saw, having coiled about themselves as new teeth were generated from behind." I've seen a Helicoprion picture with a throat buzz saw.